So with my Salvador hopes dashed I decided to head to Pirenópolis, a small historic town about 4 hours northwest of Brasilia. It is also the closest town to the Parque Nacional Brasília. The original plan was to go to this gateway city for a day and move further westward to Goias Velho. That plan never really panned out. So initially I was planning to take all my stuff with me to move on to Pirenópolis from Brasília, but my family friends convinced me to take a smaller bag for the few days that I will be gone since I had to catch my flight out to Montevideo from Brasilia anyways. In the rush of things and my paranoia of losing/having something stolen, I always dispersed my passport, IDs, credit cards and loose change. Foolishly I left the house for bus station without any ID (passport, driving licence, etc). I got to the station, bought my ticket to Pirenópolis and waited for an hour or so till departure time. When I came to board the bus I realized I did not have a single piece of ID on me. There was no way to return the ticket and obviously I could not board the bus. I felt so stupid, how could I forget the most fundamental thing in travelling. I ended up losing out on a whole day as the only bus to Pirenópolis would arrive there fairly late at night and since I did not have my accommodation set up, I ended up spending the night in Brasilia and leaving in the morning. Because of time constraints I didn’t really make it to Goias Velho and spent 2 days in Pirenópolis. The first day I spent exploring the city and trying out more fruit juices. (Random aside, I was in love with the plethora of fruit juices in Brazil. I quickly settled on a favourite maracuja (passion fruit). I was obsessed if a cafe or restaurant was out, I would leave and walk to the next. The following morning I got up early and headed to the tourist office to figure out logistics of getting to the national park and doing a bit of hiking/ seeing the various waterfalls. I bought my entrance to the park and was considering paying the ridiculously overpriced transportation fee when 2 Italians came by to inquire. We started talking and decided it would be a lot cheaper to split a cab between the three of us. The cab dropped us off at the foot of the trails near a juice stand/resting area. We arranged with the taxi to come back. We then parted ways. I started following the various trails marked out. Out of the 6 major waterfalls in the park, I could only make it to 3. It was dreadfully hot and I couldn’t really stand to hike any longer. 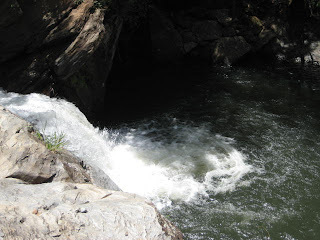 At one of the falls (called Meia Lua) I saw 2 people jumping off the side of the falls and swimming into the downstream pool. After both surfaced unharmed and realizing the water was deep enough for such a jump, I started talking to them. I found out they were both Brazilian. At this point, I really wanted to swim and more importantly try the cliff jump. So I tucked my backpack aside and with my clothes (a pair of scrub pants I wear as pjs and a shirt) I went swimming. The cliff was probably 25ft high. It was so scary, I took me a good 5 minutes of staring down at the water till I finally got the courage to jump. It was a bit tricky in the sense that you had to move back a bit and run, taking a leap as far away from the cliff and the nearby rocks to minimize injury when landing. It was so exhilarating!!! That feeling where your internal organs are crawling up to your throat. I was in the air for a good 4-5 seconds. I did the jump again 2 more times. More people caught on to this particular waterfall and surrounding pool. So when a crowd of people showed up, I gathered up my stuff and continued hiking a bit further uphill to a less crowded region. After an entire day of hiking, swimming and cliff jumping, I headed back down to the resting area to change to dry clothes and wait for the taxi so I can get back into town and catch my bus back to Brasilia. I waited for nearly 40 mins near the juice stand and no sight of the taxi driver. At this point I had started talking to a Brazilian couple vacationing in the area. Initially they thought I was Brazilian. We communicated in what now seemed to be my perfected Porteñol (Spanish and Portuguese). Lucky for me they were heading back to Pirenópolis so they gave me a ride to the bus station. I made it back 30 minutes before the bus was due to leave. Definitely good timing because at that point I still didn’t have my bus ticket yet. Although it wasn’t Salvador , Pirenópolis was just as amazing. The falls and the experience of getting to jump of the waterfalls were out of this world. I got into Brasília late Saturday night, got a few hours of sleep and then Salma and her brother Samer drove me to the airport to catch a 5am flight back to Montevideo via Sao Paulo. I’ve come to the realization that Brazilians are not really accustomed to accents. Since many Brazilians don’t really have any interaction with many foreigners, they have trouble understand those speaking Portuguese with a different accent. Some have trouble understanding those from Portugal. Also, Brazilians are very patriotic and very proud of vacationing within their country. In many cases, I found that tourists know the country better than natives because the natives don’t really travel around as much. Not really the case with Brazilians, they love taking vacations in other parts of their own country. I wouldn’t blame them, Brazil pretty much has such a vast range of options, with pristine beaches, natural attractions in abundance and lively urban culture found nowhere else but Brazil. Brazilians are super friendly and for the most part really upbeat even in their everyday language. For example “belleza” means cool or “I’m doing well” literally translated it means beautiful. Also, as a solo traveller I found that it was very easy to engage in conversations with strangers around. Generally most people around would initiate conversations. In so many cases complete strangers helped me with directions (or the ride down from the waterfalls). If I had the opportunity I would definitely like to spend a longer period of time exploring other parts of the country. Even though I covered quite a bit of ground in terms of exploration, it’s just the tip of the iceberg. Most people’s reactions in Rio when I said that I would be spending New Year’s Eve in Brasília wasn’t all too comforting. I had a weird aversion to the city before even laying eyes on it. Brasília is very unique from most other Brazilian cities, in that it was a planned city. 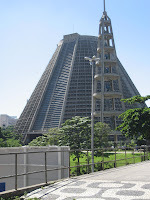 Completely planned by famous Architect Oscar Niemeyer and constructed in the 1950s to serve as the new Brazilian capital instead of Rio de Janeiro. When I actually toured the city and got a glimpse of the architecture, it seems as if it was the brainchild of some Soviet mastermind. Buildings are oddly squared and “modern” in a 1960s sense, which appear somewhat outdated now, if that makes any sense. My trip to Brasília was in complete contrast to my stay in S.P. and Rio (I will discount Sao Paulo since I was only there for a day). As opposed to all the madness and craziness of Rio and the constant movement of people, Brasília is clean, organized and very very laid back relatively speaking. Brasília is mainly associated with government ministries and embassies. As opposed to the backpacker and budgeted trip of Rio, I stayed with family friends, living in a fairly affluent part of the city. I didn’t really know what to expect, especially having gone to Rio first. I stayed with my dad’s friend’s family who is the current Sudanese ambassador in Brazil. Although good family friends, I vaguely remembered them from visits back to Sudan. So I had my reservations about that whole situation. When I arrived at the airport, I was greeted by Salma one of my dad’s friend’s daughters. She is also the same age and is studying university in Brazil. For New Year’s Eve, Salma and I went down to lake to partake in the festivities and watch condomble rituals taking place (condomble is a form of religious practice largely practiced by people of Northern Brazil, in the state of Bahia. It is a mixture of Catholic and west African religious practices). Troupes drumming dancing and singing along with hundreds of food stands. I had this one snack called acaraje. The outer shell I can only describe as falafel-like and is filled with various ingredients and topped with shrimp and super spicy chilli sauce, oh so good!. At the mark of the new year, orchestrated firework took place from the centre of the lake. Also all those taking part in the condomble rituals walked down in the lake with vases full of flowers and candles which they placed in the water to float away. Afterwards we went to a New Year’s part at the Embassy of Cote d’Ivoire. It was mostly people from other embassies as well. I had a really great time and met a bunch of people. The following days, I spent hanging out with Salma and meeting some of her friends and getting to know Brasília. Granted it was a very select part of city, surrounded things related to embassies and diplomats. Went to a bbq hosted at another diplomat’s house that lasted from early afternoon till fairly late at night. Regardless I had a lot more fun than I expected. All my reservations about my Brasilia trip dissipated, and I was really glad I got the chance to come and reconnect with these family friends. They were super hospitable. ohh random discovery at the party at the Cote d’Ivorian Embassy, an Angolan song came on and all these Angolans took to the dance floor performing steps eerily similar to the electric slide. When I inquired about this dance, I found out that this is a traditional dance from most countries in Southern Africa, usually danced to Kudouro music. So I wonder if the American version bootlegged the steps from them or was it independently conceived. Initially my plan after visiting Brasília was to head west to the Pantanal region (world’s largest wetland) for camping and such. When I got to Brazil and actually realized how hot and humid it was, I changed my mind; especially since it is the rainy season in that part of the country. In talking to many people in Rio, the verdict was clear, I had to head up north to Salvador in the state of Bahia (this region has the strongest African influence and a very unique culture). So I started looking into tickets to get there. I finally found a ticket, which was still expensive but relatively cheap in comparison to all the prices that I saw. I walked away from the computer for seriously 3 mins to discuss it with Salma and Khaltu Amal, came back to find the price went up drastically! I still didn’t want to give up so I started looking into bus options. Mind you Brazil is huge, from Brasília (which is fairly central) to Salvador (which is fairly southern relative to the state of Bahia) it takes 22 hours by bus. Despite the dreadful thought of sitting in a bus for that long, I still wanted to make it up there. After more research I found out that most buses to long distance cities leave at night to reduce daytime travel. So that meant I would spend my entire time traveling and no time to actually explore Salvador. So I missed the opportunity to see Bahia and Salvador. Definitely the biggest disappointment of my trip. Instead I regrouped and rerouted my travels elsewhere to one of the national parks several hours northwest of Brasília. I just got back from Brazil yesterday and am still in a state of depression. I so did not want to leave. Honestly I don’t know if my blog posts will do any justice to the amazing time I spent there. I spent a day in São Paulo before heading off to Rio. 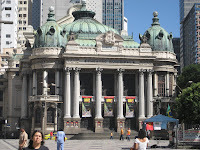 To be honest although São Paulo is a metropolis that can hold its own. It could be any major city around the world. It is probably the only Brazilian city that has absorbed so many immigrants. There is the Japanese Quarter and oh so many Arabs, primarily Lebanese. I found out that there are more Lebanese people in Brazil than there are in the nation of Lebanon, interesting (most of them live in the greater São Paulo region). A day was more than enough time for me in this city. I couldn’t wait to get to Rio. I spent 4 nights, 5 days in Rio de Janiero. 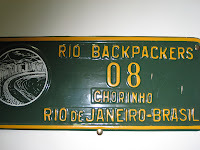 I stayed in a hostel in Copacabana called Rio backpackers. It was 3 blocks away from what probably is the most famous strip of sand in the world. I wasn’t all too concerned about the beach, I wanted to get out and see what Rio had to offer. I had my reservations about travelling solo but it wasn’t so bad. During the day I would go off and wander different parts of the city on my own. It was ridiculously hot with highs of 40 degrees C and the humidity was through the roof. Still that didn’t stop me. First day there, not knowing really where to start, I turned to my trusted lonely planet guidebook. It outlined a walking tour of the centro, which I decided to follow. I asked at the hostel reception what would be the best way to get downtown and was told the metro would be best. Luckily there was a metro station 2 blocks from the hostel. Metro was definitely very pleasant to take and offered some welcomed cool air from Rio’s dreadful heat. I started off following the lonely planet guidebook and found myself randomly veering off. So I ended up just exploring what I saw fit; stopping every so often to buy some coco water, which was always ice cold and oh so delicious (its essentially fresh coconut water poured over ice). To escape the midday heat I found a park with lots of shade and chilled there for a while and got back to the hostel in the early evening. By then I was super exhausted from all the walking. After a shower and a small nap, I got up and chatted with a few other travelers at the hostel. This is one of the many neighbourhoods of central Rio. 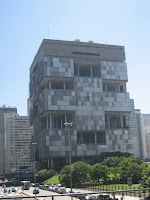 It’s located high up on one of Rio’s many ranges overlooking the centro. It used to be the exclusive region of Rio with large mansions from the 40s and 50s dotting the ridges. 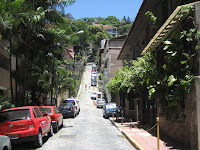 The only way to get to the top is to take street car (bondinho). 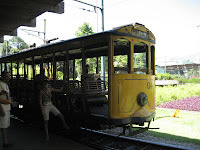 This street car is more like a trolley resembling those in San Francisco. After taking the metro to the centro and wandering off until I found the bondinho station, I rode it all the way to the last station at the top. I got off and started walking. I stopped by two museums. Along the way I stopped to take pictures of the sights down in the valley. 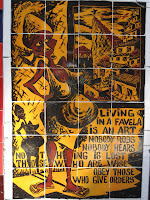 Wedged between Santa Teresa and the centro is one of Rio’s many favellas (slums). I didn’t really know that at the time. Spent most of the afternoon up there and then walked all the way down, unintentionally crossing some parts of the favella. Thankfully I didn’t have any problems. 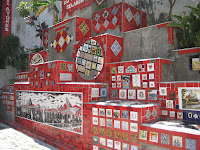 Another day I set out to find the infamous tiled stairs (Stairs of Selaron). I knew they were somewhere in the Santa Teresa/Lapa. Most people know these stairs because of the Snoop dogg video “beautiful” or Bono from U2 video. After wandering around for what seemed to be hours, I finally found them. 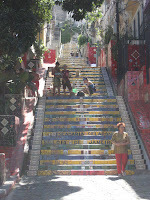 When I got there the artist, Selaron (an eccentric Chilean man) was working on the steps. 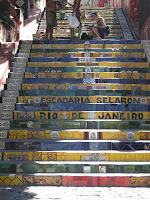 He worked on these steps (215 steps, 210 feet high) all on his own, adding all those tiles over the course of 17 years. When he saw me, he prompted his assistant to come and talk to me because he believed I was African. When he found out that I was born in Sudan, he was so excited. He told me that he had so much trouble collecting mosaics/tiles from African countries. I talked to him and his assistants for a while. I then joined them along with an American girl working on a documentary, for lunch. I got to hear so many of his crazy stories. Later on his assistant told me that it was rare that he was so talkative among strangers. I asked about how he got started on this farfetched project all on his own. He started doing so mainly because he wanted to people to come see his paintings. This area of Lapa, at the time and still to this day to some extent is fairly dilapidated and extends upwards to the favella between Santa Teresa. He thus started to clean up the stairs and the area around his home. Afterwards, it became his lifelong ambition to continue to tile the entire set of stairs. Initially he started with Brazilian colours, then he expanded to add others. Now he receives numerous tiled gifts, some which he puts up on the walls along the stairs. He gave me one of his small sketches. I in return promised to send him a tile representing Sudan so he can add it to the walls along the stairs. Now the Brazilian government has officially decreed that the stairs are a national landmark and any tampering to them would result in jail time or fines. Only Selaron has permission to make additions or changes. After meeting Selaron and his assistant, Angela, her girlfriend Jarim (both from Mexico), We agreed to meet up once again with more of their friends.. Jarim initially came for a 2 week vacation and ended up loving Rio so much she decided to stay. I also met their friend Mercedes who was visiting from Mexico. They invited me over to their place for dinner and to experience some of Lapa’s Friday madness. 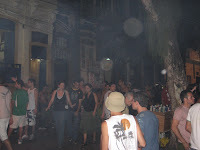 Every Friday night the streets of Lapa turn into one giant Samba party. This weekend the crowd was ten-fold stronger as it was nearing the new years. No joke, there were probably a good 8,000-10,000 people all over the streets. It was CRAZY! and so much fun to watch. I got to Angela/Jarim’s place which was close by and had spectacular views of the city. They have a rooftop balcony (sutu7), where we sat around eating and chatting. 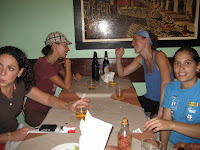 I met more of their friends and got to know so much more about Rio and their crazy adventures with Selaron. Juana! One of the highlights of my trip was meeting up with Juana (who was in town with her fam visiting her cousin). 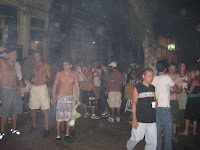 We spent an entire day near the centro (where we were approached by 3 guys, immediately we knew what was happening. They started asking for our cell phones, neither of us had any. Then they started talking faster in Portuguese. When they saw we really didn’t have anything one of them went for Juana’s bag that had a really thin strap. When I tried to grab hold of her hand the third guy came in between us. We didn’t bother trying to hassle because it wasn’t worth it. They made out with 80 reals, which is roughly $44USD). We definitely didn’t let that incident ruin our day. Ironically that turned out to be one of my best days in Rio. I guess being mentally prepared for the reality of this city helped. This in no way should deter others from visiting. Just be careful and be ready to give up what you have. They didn’t go for my bag, so continued on with the day. Stopping at Jarim/Angela’s place for a bit then to a major feria (market), then more walking around eventually took the cable carup to Pao Azucar (Sugarloaf) where we spent hours chatting till near sunset. Followed by dinner. 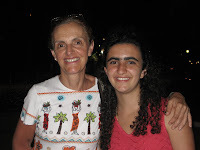 The following day I met up with Juana and her mom for dinner in my last night in Rio before heading out to Brasilia. I can go on and on about Rio, but I’ll let some of my pictures speak for themselves. There are days I didn’t take my camera along because I was walking around the city too much. Sadly one of those days I ended up going up to Corcovado (Christ the Redeemer) and and roaming around Leblon and the Lagoa Rodrigo de Freitas areas. I left the morning of the 31st to Brasilia.